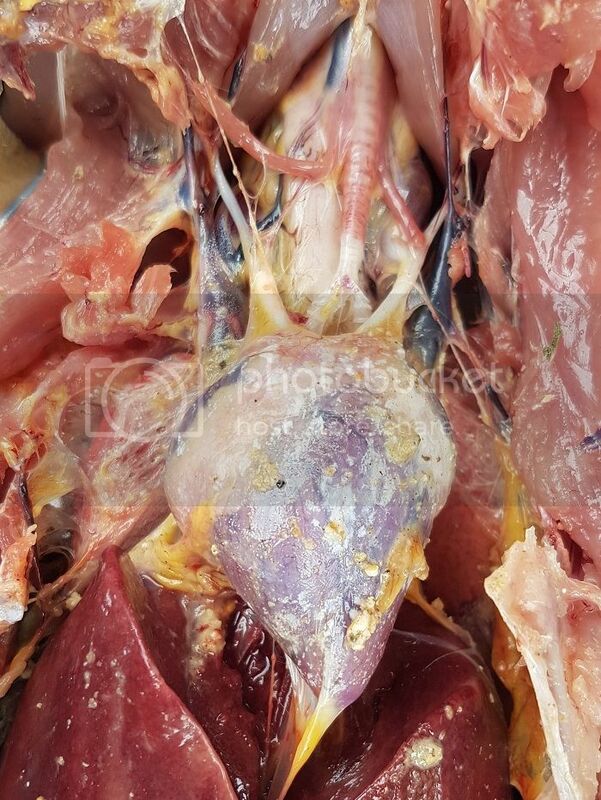 Poultry Central - The New Zealand Poultry & Chicken Forum • View topic - Two dead chooks in 10 days - WARNING graphic photos! Two dead chooks in 10 days - WARNING graphic photos! OK team, I recently had 2 chickens die within a 10 day period - both large silver pencilled wyandottes from the same brood, 11 months old. Both had a purple comb when found dead, so I am thinking something heart or circulation related. Didn't notice any symptoms in the first one, just found her under the perch. The second was in a broody coop with her chicks at the time, and the afternoon before she died I noticed she was a bit hunched and fluffed up, and her comb was a bit discoloured, but she happily stood up when I threw in some food, so I didn't think much of it until I found her dead the next morning. 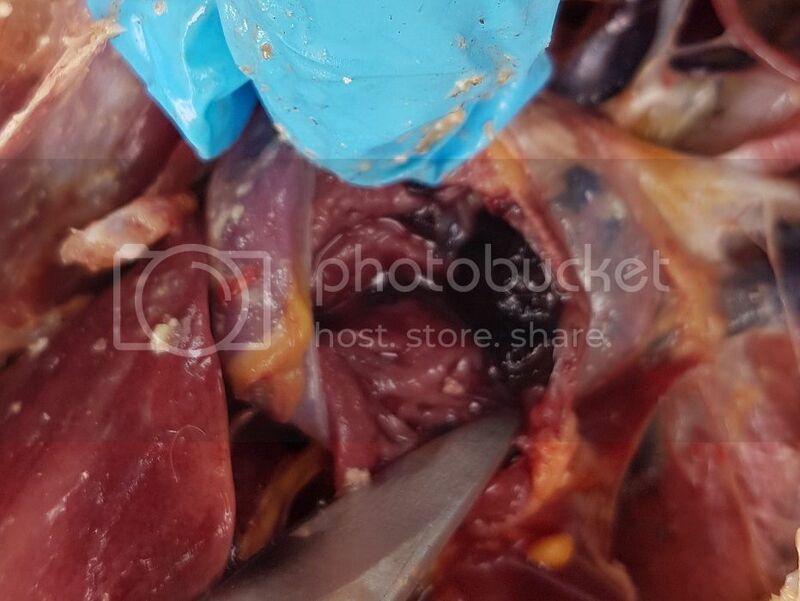 I attempted a necropsy on the second, but it quickly became clear to me that I didn't really know what I was looking at, or what was normal for a chickens insides (note to self, pay more attention when processing roos!) So here are a few pictures I took, please yell out if anything looks abnormal/like a possible cause of death. I would obviously like to know if it is something infectious so I can act before any more drop. Re: Two dead chooks in 10 days - WARNING graphic photos! I have absolutely no idea, but I think good on you for having a look around. Hopefully one day I'll be able to bring myself to do that. Sorry you lost two so quickly. We had 3 instances of a weird illness (which led to culling) this year, and all between 6 and 9 weeks of age. Disappointing as I'm pretty sure they were all pullets. Sigh. 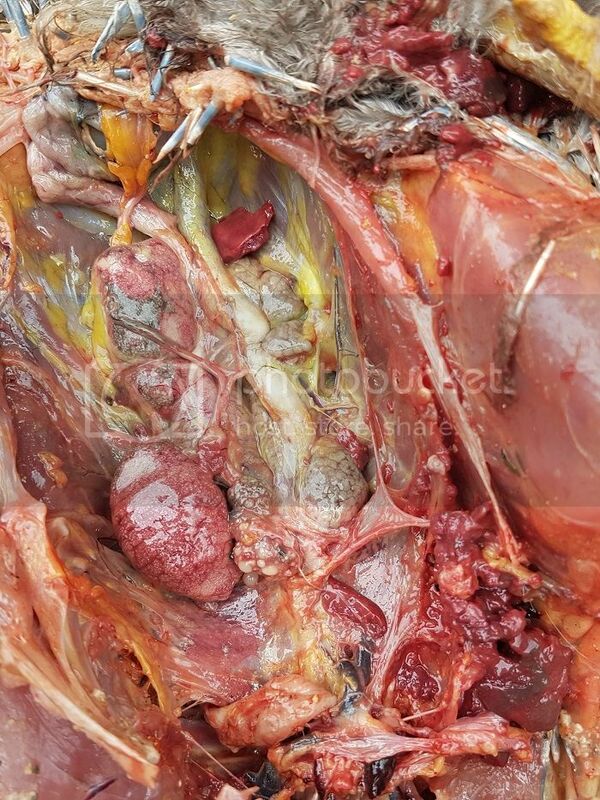 Heart, liver and lungs look ok to me - the blood clots are the result of dieing. As she didn't bleed out through her neck, the blood is where it happened to be and coagulated there. BUT - those greyish white things along the spine?? I don't recall ever having seen that. The kidneys should be there - smooth dark red, a bit darker than the liver. 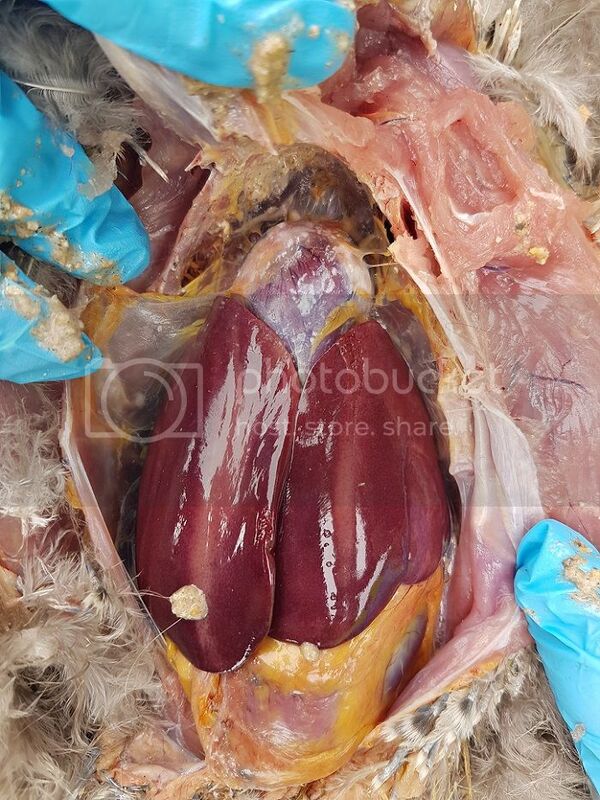 And if that pink lump is the spleen - goodness, that should be really dark, too. No dotty pattern. As to the cause of death - I have had the very same thing happen a few years ago, also with 2 mature hens, both in the nesting box. I think it was white tailed spider bite. Our daughter was bitten a few days later - while asleep in her bed. It was a huge lump on her leg, the bite marks could be seen clearly, and it required medical attention. Both hens were curled up when I found them - dead. One I found just dead, the other had breathing problems, then died within hours. I didn't open them up so can't tell you how they looked. A good sign whether you have white tailed spiders is the absence of daddy longleg spiders. Like with all other biting insects - it depends on what it had bitten previously on how bad the bite will be and a chook is small compared to a human being so a bite would have much more of an impact.